“What’s in a name? That which we call a rose by any other name would smell as sweet.” It turns out that not all my Facebook fans would agree with Juliet! I was hesitant as to whether to title this dish a “casserole” because I’ve heard a lot of people shun that entire category of recipes. This confused me, because to me a casserole is just any combination of ingredients layered or mixed together and baked in a 9×13 baking dish. I decided to pose the question to my core group of readers on Facebook and though the majority were casserole lovers, several people mentioned that the word has a negative connotation either to them or someone in their immediate family. Something to do with cream of (chicken/mushroom/etc) soups, it seems. Since you won’t find any of those in this recipe, I decided to call it a bake so that all you casserole haters out there will try it! A special shout out goes out to all you Minnesota readers who suggested I call is a “hotdish” – I’ve never heard people call casseroles that before! Let me get this out of the way by saying I’ve never had a traditional tamale, so I have no idea if this recipe mimics authentic Latin American tamale flavors. What I do know is that it’s delicious, and that’s all that really matters, right? I absolutely loved the combination of the slightly sweet corn cake and a little bit of heat from the chiles, cayenne pepper and enchilada sauce. I know a lot of you are Bubble Up Enchilada fans, but I personally liked this dish even better and it’s just as easy to make. I think it had something to do with the corn cake smothered in enchilada sauce and covered with chicken and cheese. Yum. Whether bake, casserole or hotdish, however you’d like to refer to this recipe, I know it will not disappoint. You may even want to call it a casserole. Try it. It may just change your mind about them! It’s this easy! (see full directions below) Stir together the first 8 ingredients (minus some cheese) and pour into dish. Bake. Poke holes. Spread the ingredients above on top of the corn cake. Preheat oven to 400 degrees. Lightly mist a 9 x 13 baking dish with cooking spray and set aside. In a large bowl, mix together ¼ cup of the Mexican cheese, the milk, egg, cumin, pepper, corn, muffin mix and green chiles in a bowl until combined. Pour the mixture into the prepared baking dish and bake for 15-20 minutes until the layer is set (an inserted toothpick should come out clean). 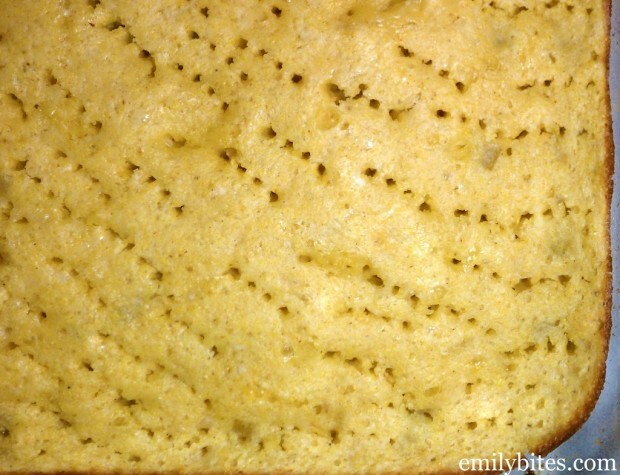 Using a fork, liberally poke holes all over the surface of the corn cake layer. Pour the enchilada sauce over the top and spread across the surface of the corn cake. 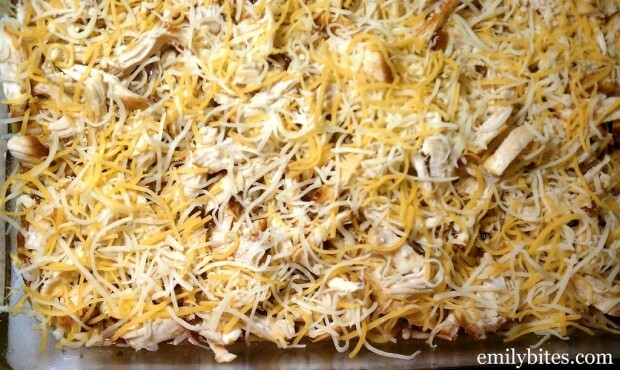 Sprinkle the shredded chicken evenly across the top and follow with the remaining ¾ cup shredded cheese. Return the dish to the oven and bake for another 15 minutes. Let cool 5 minutes before cutting into servings. I seriously can’t wait to try this!!! Thanks Jackie, hope you love it! I’m making this tomorrow. How did you do the chicken? There’s no oil in the recipe and I don’t want to add any extra points so I’m wondering how you prepared yours. Thanks! I grill mine on my George Foreman grill. You could also always cook it in a nonstick skillet, bake it, boil it, buy a rotisserie, etc. No oil needed! I was going to ask how you did the chicken, glad I read the comments first. And thanks SO MUCH for this link to the crockpot shredded chicken. I’m going to try this for sure. My husband LOVES chicken so I suspect I’ll be making this a lot. I put my chicken tenderloins in the crockpot with an onion and half of the enchilada sauce. (on high 5 hours)it came out great! OMG I must try this soon!!! Looks amazing!!! Oh, I am SOOOOO making this this weekend! I think I have nearly all the ingredients! Thank you! Awesome, let me know what you think! It’s so weird, I guess I just never grew up thinking of casseroles that way! I don’t think my mom made the kind everyone else pictures. OH migoodness! Saw this (I think via another recipe post on Pinterest) this morning, decided I would make it for dinner tonight – it just came out of the oven and IT. IS. DELICIOUS! I used fullfat cheese, mainly because it’s what we had – and @WendyG: for anything that requires shredded chicken I keep a bag of flash-frozen chicken in the freezer – pop however many pieces in the oven (no need to thaw) and in 20-25 minutes you have cooked chicken, no added fat. I am so happy you loved it!! Great tip for cooking the chicken, if Wendy or anyone else catches that. I’m happy you found my blog too, let me know what you try next! Made this tonight and love love loved it! I thought the bubble up enchiladas was your best recipes, but this wins. I used a green enchilada sauce and it really had a great kick to it! I will try it with the red enchilada sauce next time! Thank you so much. I’ve been making your recipes 3-4 nights a week! Awesome! I will have to try it with green enchilada sauce sometime too. So glad you’re loving the recipes! I had to read this post to my sixteen year old son. When I got to the part about you never hearing a casserole called a hotdish before his eyes about bugged out of his head. lol Yes, we’re from Minnesota! i made this last night. we LOVED it. so good. I used chicken short cuts because I had them and we didn’t want them to go bad. SO GOOD. Also – i’ve never heard of ‘hot dish’ either. So happy you loved it! I use pre-cooked chicken sometimes too, especially for things I want to be ready super quick like Buffalo Chicken Pizza. Ummm…all you have to say is “casserole” and I will automatically be sucked in. One pot meal that I can leave in the oven while doing other things? Sold! 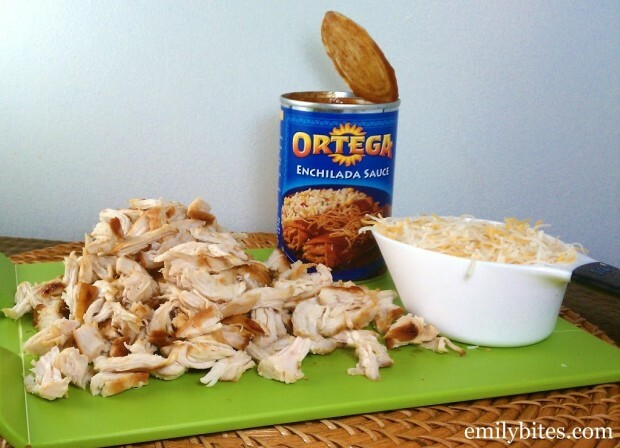 I added some of the enchilada sauce to the shredded chicken. Sounds yummy. Hope you like it, Kayla! Okay, I made it last night and it was DELICIOUS! 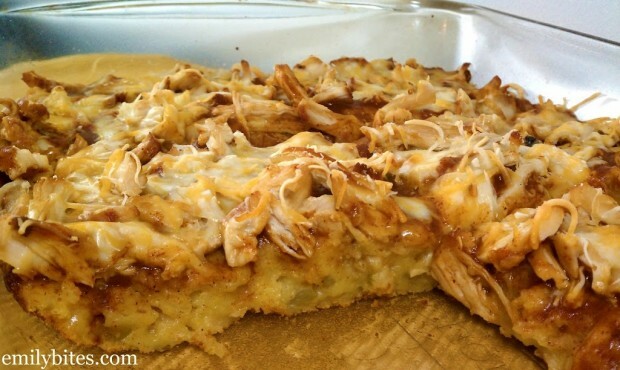 It’s like having a layer of corn casserole with chicken-sauce-cheese on top. YUM! So yummy. And even if it’s “slightly adapted” from Cooking Light, I’m so glad you posted it. I never get too far in the Cooking Light website–it’s great to have the WW conversions to show me that I can have it. A lot of the Cooking Light recipes don’t feel that light. 🙂 Plus your introductions that tell how hard it was…or how well it was liked by your family…that’s irreplaceable! This is my favorite recipe of the new year. Great job! I’m so glad you enjoyed the recipe! I think if I make it again I’ll try out your ‘slight adaptation’ as well :). According to my husband, “the best recipe I have made so far.” And….also one of the easiest. This will be going in my monthly rotation for sure! Made this last night for dinner. Substituted med. green enchilada sauce for the red and frozen corn for the cream style corn. It was fantastic! Will definately be making again. I was thinking you could also make this into an appetizer using mini muffin tins. Could also swap out the enchilada sauce for buffalo sauce to appeal to other tastes! Thanks! I hope you like this, let me know. It’s definitely easier to make than traditional tamales! Yummy! Made this for dinner last night, and then took the leftovers to work for lunch. I used a bigger can of enchilada sauce than called for… oops! But it didn’t seem to make much of a difference. Just a little extra juicy! Ingredients bought, and I may make this tomorrow! I like that most of it can be stored in the pantry, and be ready when I am, in case I don’t get to it tomorrow. I have frozen shredded rotisserie chicken ready to be thawed. I wonder how it would be with added sauteed mushrooms and/or red pepper to increase the veggies? Made this tonight… as always, delish!! I cooked this tonight and it was delicious. I used green enchilada sauce instead since it’s my favorite! I love your recipes, they never disappoint! Thanks! Glad you loved it. I’ll have to try green enchilada sauce – would you believe I’ve never had it? I made this tonight. It was great! It was easy, and I don’t even like to cook! My sister loved it too! I would make it again! I made it as directed, except that instead of using cumin and cayenne, I substituted 1 tsp of Penzey’s Adobo seasoning, which has cumin and cayenne pepper already in it. I served it with spring salad greens, mixed with sliced grape tomatoes, sliced pickled okra, and sliced avocado. It was a really nice meal! Awesome, Debbie! I’m so happy this was a success. Sounds like a perfect meal to me! I was wondering what the spicy level is for this? I love all things spicy, but my husband has a sensitive stomach. It’s not very spicy. As long as you use a mild enchilada sauce, he should be fine! i discovered it the day you posted it, and it has become one of our go-to recipes in a short period of time! i felt the need to share it with all my friends, it’s SO good. i was making it last night after a late night at work, so i was exhausted and starving. forgot to add the egg, and thought the recipe called for a can of black beans based on my previous recollection (i think i was confusing elements with the bubble up enchilada). realized after i opened the can of beans they were required, so i threw um on anyway. and forgetting the egg, and adding the black beans, didn’t change much, still tasted equally delicious!!! plus according to the recipe builder, it somehow lowered it 1 point, to 6 points a serving. it’s so good, i wish i brought more for leftovers today for lunch! your recipes are all so great, i swear your site is keeping my fiance and i eating healthy and well. thank you!! I’m so glad it’s been such a hit for you! I love black beans, so that sounds delicious to me too! Thanks for all your nice words. I’m happy you and your fiance are enjoying the recipes! I love black beans too, great idea. Glad it was a hit! I’m making your Deep Dish Pizza Casserole and French Dip “Cupcakes” for some other friends to celebrate my husband’s bday this weekend. I’ll report back! I made this yesterday and it was very yummy. The base reminds me of my favorite paula deen receipe (corn casserole) that I take to pot lucks. My husband ate two servings and thought it was very good. We have really been enjoying your recipes these last few weeks and I plan on working on some of the pizzas this weekend! My family loved this!! I used tyson canned chicken breast, 98% fat free, and shredded it with a fork…worked great! Glad it was a success, Jess! It’s nice anytime you can find little shortcuts! This was absolutely delicious and filling! I had it last night with steamed broccoli and it was an extremely satisfying meal : ) Thank you! So happy you liked it, Heather! I haven’t frozen it – let me know! I sure will! Thanks again! Freezing gets the thumbs up! It reheated in the microwave like a charm. Simply awesome, it’s a keeper. I made this tonight & we all loved it. My teenage son & I are doing WW together so it’s so great to find a site that has food we actually want to eat! Thank you!!!! Had this for dinner tonight, it’s a keeper! My husband loved it, and never guessed it was WW friendly! just made this-SO delicious! thanks for all the great recipes! This could be the best thing I have made or ate ALL year. Great find for me and my family, thank you for sharing. we loved it. This is really, really good! I cut it into 8 servings. I ate one of them. I froze the other 7 in individual ziploc freezer bags. Then when I needed something to take to work for lunch, I got one out of the freezer, let it thaw until lunch time, then heated it in the microwave at 50% power for about 3′. It still tasted great, and so, so much better tasting and better for you than icky frozen diet dinners. Now I’ve finished all my freezer portions and need to make another batch!!! This one is fantastic Emily!!! I too had not had a tamale while I lived in Buffalo, but now that I’m in Los Angeles, tamales are everywhere. Quite frankly, I usually find them a bit bland – but your version is a breath of fresh air. I think its the sweetness in the corn bread mix that makes the big difference for me. This also works great the next day for lunches!! So happy you liked this one, Phyllis! I will have to try an authentic tamale sometime and see what they’re like. I like a sweet and savory mix as well. Thanks for the comment! I was wondering about how many ounces of chicken breast you used to get 2 cups of shredded chicken? Sorry, I didn’t weigh it, I just used 2 cups! Can you tell me what brand of cornbread mix you used? Just made this for dinner tonight. Husband loved it and it will definitely become part of the regular rotation. Being a Southern California native, I had to up the Mexican-ness of this dish a bit. I sliced up poblano chilis and spread them on top and swapped out the shredded cheese for queso fresco. I made a suiza sauce instead of the enchilada sauce. Next time I might try doing just a masa base instead of corn bread. If it works we may have fixed the world’s most labor-intensive food- the tamale. Love this recipe…we keep it on our weekly menu and always have enough ingredients in the house for 2 casseroles! I did change it up a bit though…my husband doesn’t care much for chicken. We use lean ground beef instead and it is still amazing! What a wonderful meal, I make it all the time. My husband loves it and I have told everyone that I know about your site! Keep up the great work. Love that you also include WW points as well. Thank you so much! I’m in the midst of making this now. Can’t wait! So far everything I’ve made from Emily Bites has been awesome. These healthier versions of recipes allow me to eat how I like to without making my boyfriend feel like I’m forcing my “rabbit food” upon him. Dang girl! Home run. Made this today for my lunches for the week. I accidentally cut into 6 servings (so they are now 9p+ per), but I still think it’s pretty decent for such a decadent meal. I left out the green chiles because I’m not a fan of peppers. I used the mild ChiChi’s brand enchilada sauce and it still had quite a bit of kick! I really, really like it. 🙂 Thanks!! 15 minutes left on the oven!! So excited to try this out! Another AWESOME recipe! I’m pretty much obsessed with your blog! Thank you so much for all of the awesome ww recipes! Amazing!!!! My hubby loved it! I made this last night and it was SO good! My husband absolutely loved it and he is a picky eater. Because there are 2 of us, I split the recipe into 2 smaller pans and we ate the entire pan! I froze the other pan for a later meal. I topped mine with cheddar and Monterey jack cheese. Fantastic! Thanks for the recipe! I made this tonight. Scrumptous! We all loved this casserole. A keeper. Only thing different I did is—-I thought I had enchilada sauce, but only had green chili sauce. Still turned out yummy! Emily, I just found your site last week and it’s been amazing! I’ve been on Weight Watchers for 8 months now and desperately needed some new recipes to shake it up a little bit. You’re a lifesaver! I made this dish last night and it was really good! I’m a Southern California native, so I can confirm it doesn’t taste anything like a tamale.. but who cares! The sweetness of the corn cake was really nice with the enchilada sauce. My family was a big fan and I’ll definitely make it again. I have made it twice since finding the recipe and I would make it again tomorrow. Its so easy and so good. We fight over the leftovers and I have yet to win. I am going to double it next time so I know I wont miss out. Made this for my family and my 4 boys asked why I only made one pan! They were disappointed there were no leftovers for them the next day. Thanks Emily for another great recipe. WOW. This was absoultey DELICIOUS!! Definitely one of my faves. I took this to our potluck at church tonight it was a big hit. Thank you for the recipe. This was fabulous! We loved it! I love this its easy to make and taste delicious. I would even make just the corn bread to eat. Wonderful recipe. Thank you so much! I made this a couple nights ago and it was delicious! It was pretty quick and easy to make too! I’m definitely going to make this again! Made this last night but I overcooked the chicken and used cannellini beans and a can of turkey chili (no beans) as a substitute. Desperate times call for desperate measures!!! It was a HUGE hit!!!! So for vegetarians, it would be great w black beans! Maybe even ff refried? Perfect recipe, loved it!!!! Thank you!!! Made this last night for supper after working all day. It was supper easy and YUMMY! My sister ate with us and normally doesn’t like healthy meals, but she loved it. My husband also loved it, he said we definitely have to keep this on the menu and he isn’t a huge chicken fan. It is also very filling! Thanks for sharing your recipes! One of the best recipes I’ve ever made! This comes together super quick. I made this for a friend and her family after she had surgery and her husband commented “it’s like crack, it’s so addicting”. I’ve made this for adults, kids, potlucks, etc and I’ve never had anyone not love it and ask for the recipe. I made this for our supper tonight. Actually this is the second time I have made this and there are no leftovers! 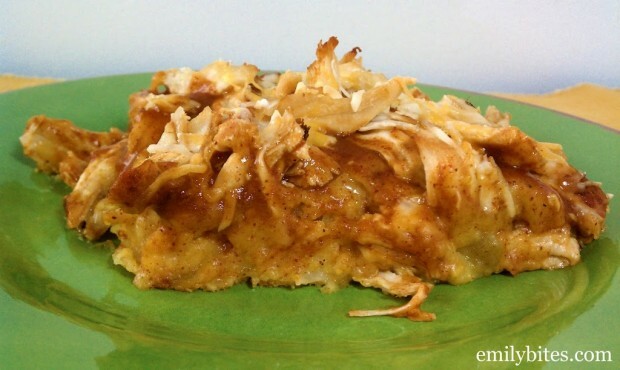 We are not big fans of chicken, so this casserole makes it easy for us to eat chicken. Thanks Emily! We had this tonight and it was soooooo good. Thank goodness there are leftovers for me AND non WW hubby to take some to work tomorrow. The portion size is huge, and the dish is savory and satisfying. I used the breast from a Costco rotisserie chicken and everything else was exactly the same as the recipe. Like the contributor before me, I do not like chicken at all, so to find a chicken recipe that is so yummy I want to go back for seconds… Well it’s a keeper. That sweet corn cake base is awesome enough by itself (as dessert maybe with a Yonanas ice cream or fresh strawberries on top). And it couldn’t be easier to throw together. I will make this again and again thanks Em! Oh, that’s weird..it looks normal on both of my computers and I haven’t heard that from anyone else. Maybe it is your settings? Either way, glad you found it. How many ounces is two cups worth of chicken? I made this for the first time on Sunday for work lunches this week and it was SO easy and delicious. I cooked the chicken the night before in my slow cooker (I doubled the amount of chicken and used half for your cheesy chicken and broccoli casserole which is also a hit). I cut it into six servings instead of eight to make it a bit more substantial but still less than 350 calories (I don’t count points). The smaller portion would’ve been perfect with a salad or veggie on the side, I’m just too lazy to prep two things for lunch in my work kitchen! I will definitely make this again soon, even after I eat it for lunch all week. Thanks again for your creative and delicious recipes that make eating healthy easy and fun. OMG! This was SO good! I even forgot to add the egg, and it was still great. Thank you for the recipe! I love your blog, and I cook recipes from it 3-4 times a week. Thanks! This recipe is 9 SP on the new plan FYI (8SP if you leave out the cheese). Can’t wait to try it! I was wondering what I could make that is different than how I usually cook boneless skinless chicken breasts. Well here it is, I am cooking this tonight. Well, I cooked this dish, like I said I was going to. I added more chicken and cheese to it. It is so good. Tried this last night and it was a hit! My son and his friends enjoyed it as well. I prepared it according to the instructions and made the shredded chicken in the slow cooker using the link provided above. Very easy and tasty! I served it with a dollop of light sour cream and some chopped green onions. Will definitely make this again. Love your site, thank you for all the weight watchers friendly recipes!! Thank you so much for this recipe. My family loves this one (including my picky eating 3 year old)! I’ve been making it on the weekends for dinner and taking the leftovers to work during the week. I love to add shredded lettuce with mine and a dollop of light sour cream. I loved this! I used green enchilada sauce instead of red and it was great. Tasted great warmed up the next day, too. I just wanted you to know it’s 6 years later and this delicious casserole is STILL on regular rotation in my house. Thank you for such an easy, fast & delicious meal! I have been making this dish for years. This was the one WW dish I could make while I was alone on WW and my famjily wouldn’t complain. I had to adapt it 2 years ago to use gluten free corn bead mix – still just as yummy. Now my whole family has just joined WW and guess what is for dinner tomorrow night??? Can’t wait to have it! Making this right now-very excited to try it! If you still haven’t had a tamale—do it!! It’s a Christmas tradition in AZ. I am trying this with green enchilada sauce to make it like a green corn tamale. Thanks for all the amazing recipes.